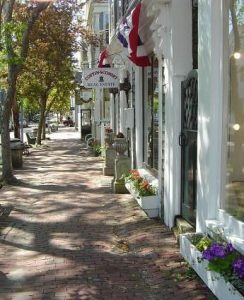 We think Nantucket is one of the nicest islands in southern New England, with a special history and feel unique to this island. If you stand on the eastern shore of Nantucket and look east, the next bit of land, if you could see it would be Europe, as Nantucket is the Atlantic gateway. In fact, the word Nantucket is a Native American word for “land far out to sea”. This made Nantucket the perfect location for whaling ships to head out into the Atlantic on the hunt for whales. 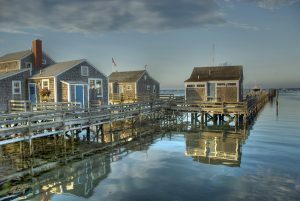 At the height of the whaling industry, Nantucket was the homeport for 88 whaling ships, and the third largest populated community in Massachusetts with 10,000 residents. Whaling ships eventually became too large to fit into Nantucket Harbor and the whaling industry moved to New Bedford. Taking the main industry away from Nantucket left an island locked in time, and today Nantucket is very reflective of how the island looked at the height of the whaling industry. The Nantucket Whaling Museum is downtown and well worth visiting. Take time to visit this museum and then wander the streets of Nantucket lined with the homes of the whaling wealthy from the 19th century, many with widow’s walks on the roof, used to look for the return of whaling ships into Nantucket Harbor. The town ringing the harbor is still laid out as it was when whaling ruled this island, and cobblestone streets are still evident. Spending time on this island is a look back into history and a unique industry that once centered here on Nantucket.